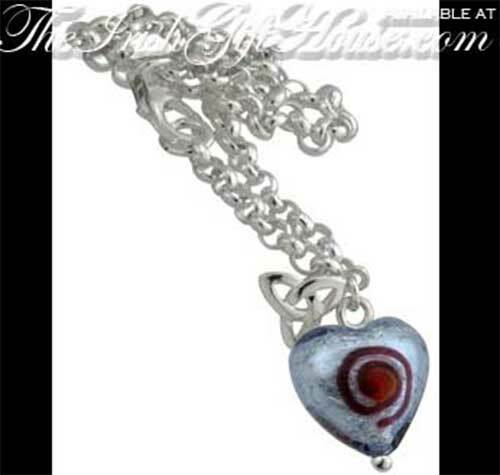 The Glass Bead is Blown Over Solid Sterling Silver. Glass Bead is 1/2" Wide & Trinity Knot is 3/8" Wide. This sterling silver Celtic bracelet features a 1/2" wide blue glass heart charm that is blown over solid sterling silver and enhanced with an enamel Celtic spiral on both sides. The link bracelet, with an included 3/8" wide Trinity knot charm, measures 7 1/2” long and is gift boxed with Celtic knot and the Newgrange spiral history cards, complements of The Irish Gift House. This Irish charm bracelet is made by Solvar Jewelry in Dublin, Ireland.